1. 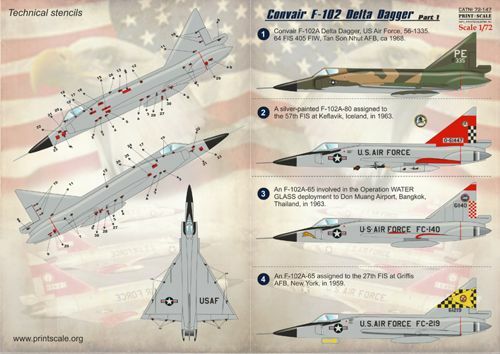 Convair F-102A Delta Dagger, US Air Force, 56-1335. 64 FIS 405 FIW, Tan Son Nhut AFB, ca 1968. 2. A silver-painted F-102A-80 assigned to the 57th FIS at Keflavik, Iceland, in 1963. 3. An F-102A-65 involved in the Operation WATER GLASS deployment to Don Muang Airport, Bangkok, Thailand, in 1963. 4. An F-102A-65 assigned to the 27th FIS at Griffis AFB, New York, in 1959. 5. A camouflaged F-102A assigned to the commander of the 509th FIS based at Udorn RTAFB, Thailand, in 1968.